Heat oven to 350°F. Spray 8x4-inch loaf pan with cooking spray. In large bowl, mix sausage, mozzarella cheese, onions, bread crumbs, Parmesan cheese, egg, salt and pepper; stir to combine. Press mixture in loaf pan; spread evenly. Bake 30 minutes. Top with tomato sauce; bake 25 to 30 minutes longer or until cooked all the way through in center (meat thermometer inserted in center reads at least 165°F). Let stand 5 minutes. Run knife around edge of pan. Gently remove from pan; cut in 8 slices. Top with basil. Line loaf pan with foil for easy removal. Can’t find bulk Italian sausage in 1-lb packages? 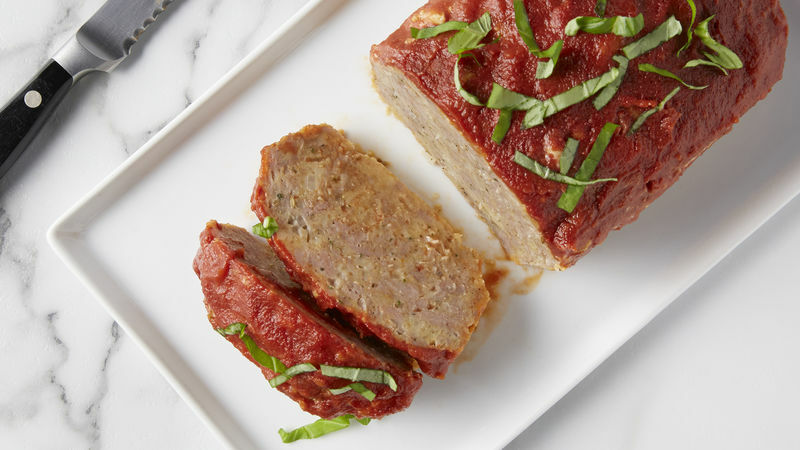 Use 1 lb of link Italian sausage instead; remove casings before adding to meat loaf mixture.